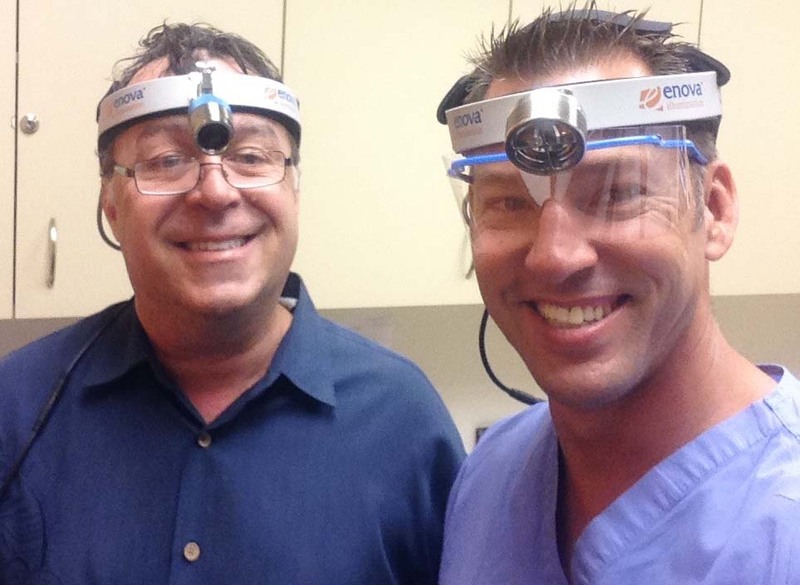 Dr. Bilodeau wearing the XLT-125 (on left) and Dr. Rouleau wearing the S-100 (on right). Shedding Light caught up with Christian Rouleau, DMD, MD, to talk about his practice as a freelance oral and maxillofacial surgeon, why his Envoa LED surgical headlight is the single most used instrument in his practice, and why he tells all of his colleagues about his headlight. Shedding Light: Tell us about your practice? Dr. Rouleau: I currently practice in the Palm Beach area of Florida as a freelance oral and maxillofacial surgeon. Working freelance lets me serve a number of general dentists who prefer to have a specialist come to the patient rather than have the patient go to a referral. I serve seven different dental locations and have learned that patients typically prefer seeing a specialist in their own dentist’s office. Before coming to Florida, I specialized in oral and maxillofacial surgery at Harvard/Massachusetts General Hospital in Boston and attended Harvard Medical School. Shedding Light: How does lighting impact your ability to perform surgery? Dr. Rouleau: Clearly seeing every detail during surgery is extremely important when performing surgery. I’ve used fiber optic headlights in the past but the quality of light breaks down a little after every use; the light leaks in the same way a garden hose with a tiny hole lets small amounts of water escape. Fiber optic headlights are also cumbersome if you need to move around the patient. Before purchasing the Enova S-100, I used an LED headlight that had batteries mounted on each side of the headband. That particular headlight was heavy and dug into my head. Shedding Light: How did you first hear about Enova? Dr. Rouleau: I was tired of trying crappy LED headlights. I purchased my Enova S-100 headlight after seeing it at the Annual meeting in San Diego in 2012. I immediately liked how feather light the headpiece was. And, the light is positioned perfectly between my eyes with minimal shadow. Shedding Light: What do you like best about your Enova LED surgical headlight? Dr. Rouleau: This headlight is my work horse. It is the single most used instrument in my practice. I use it for every examination and surgical procedure. It offers perfect focal dimension and is very bright. Lighting from office-to-office can be very inconsistent, but my S-100 provides superb illumination. It is the only light I need and because it is portable, I take it with me to every office visit. As I said earlier, it is so light I forget it is on my head. Shedding Light: How often to you charge your S-100? Dr. Rouleau: Charging the headlight is fast; it charges within an hour. I can be in surgery for a number of hours and the headlight stays charged. In fact, one charge will last a little over a week on the lowest power setting and I perform a minimum of 20 procedures during a week. Shedding Light: Have you recommended Enova LED surgical headlights to your colleagues?